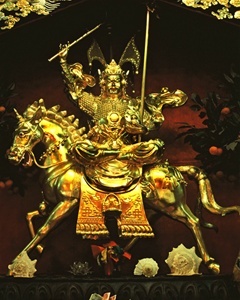 This golden Gesar rupa is front and center on the main shrine in the Gesar Palace just outside Darlak, Golok, eastern Tibet. When Sakyong Mipham Rinpoche visited in 2001, his party was told that this newly constructed Gesar palace is built on the actual location of the historical King Gesar's palace. According to photographer Diana Church, "There was much excitement when we were there because someone had just arrived with a rock that had the hoofprint of Gesar's horse on it. The beat goes on. Gesar is the gift that keeps giving." Photo by Diana Church, 5" x 7"